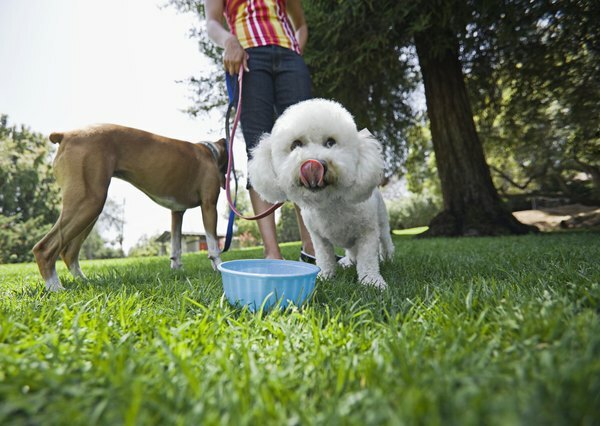 Healthy foods will help your poodle stay happy and healthy. Although tiny in size, toy poodles are big on personality, intelligence and awareness. They're also quite sensitive, both to the world around them and the food that goes into their little bodies. Indeed, there are certain foods that may help toy poodles live a long, healthy life. The "French poodle" evolved eating foods native to this origin, and some poodle parents may wish to include foods specific to their pup's origin. But the main focus should be offering a variety of balanced ingredients known to optimize dog health. Every poodle is an individual, and parents can construct diets specific to their own furkid. For example, they might offer healthy oils if their toy has skin issues, or avoid wheat if it causes reactions like itchy ears. Animal protein should make up at least half of your little one's diet, likely more. Offer poultry, fish, lamb and eggs. A 6-pound poodle may need around 250 calories a day, with at least 150 calories from animal protein. Three ounces of turkey breast, 6 ounces of chicken breast, or 3 ounces of salmon all contain roughly 150 calories, much of which is protein. Choose human-grade meats you would eat yourself, and avoid by-products or foods of questionable origin. Vegetables, fruits, and starches like brown rice, potatoes and oatmeal all offer complex carbohydrates, vitamins and fiber. Avoid wheat gluten and corn as they are common allergens. Also avoid grapes, onions, macadamia nuts and avocados, all toxic to dogs. Cooked veggies are more digestible for dogs. Roughly, carbs can comprise about a quarter of your toy's diet, so with a daily 250-calorie-per day requirement, that's about 60 calories--found in 3 ounces of potatoes, 2 ounces of rice or 1.5 ounces of oatmeal. Fats have an important place in the diet, offering fat-soluble vitamins and essential fatty acids. Certain fats are highly beneficial, fighting inflammation, increasing immunity and improving brain function and skin condition. The meats in your toy poodle's diet contain some fats, and you can also offer beneficial oils including wild salmon oil, flax oil, coconut oil and safflower oil. In general, aim for a diet with approximately 15 percent fats, including these healthy oils. New foods should be introduced slowly, one at a time. This helps your furbaby adjust, and lets you determine which new ingredients he likes, and which ones he'd rather kick to the curb. Cross-check your poodle's food and calorie requirements first, and then make a slow transition to a beneficial, healthy diet that can help you and your little toy poodle live a long and healthy life together.